Tahitian Noni® TrūAge Pure™ is the most concentrated version of our bioactive beverage - stripped down to the bare essentials. It's nothing but powerful pure noni juice. Provides 72 mg of bioactive iridoids per 60 mL serving and is available in 750 mL glass bottles. 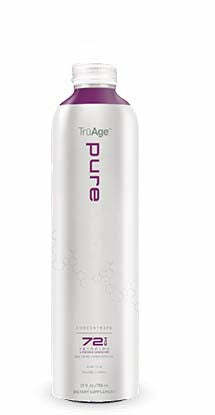 TrūAge Pure is a concentrated version of noni iridoids, perfect for blending into your favorite smoothies or other drinks. Just one tablespoon adds an 18 mg shot of pure noni fruit and noni leaf iridoids to your food. Use one ounce to mix with, and supercharge your favorite drink or experience the bioactivity by placing Tahitian Noni® Pure™ on the tip of your tongue for 30 seconds. Morinda citrifolia (noni) fruit purée and Morinda citrifolia (noni) leaf tea. Provides 72 mg of bioactive iridoids per 60 mL serving.